It's late, it's been a long day, you're starving, and you're too exhausted to cook. Hitting up the drive-thru seems like the best option — but we promise you, it's really not. The reasons to boycott fast food go way beyond the obvious health concerns — although caring for your (and your family's) well-being should be reason enough alone. If you take a moment to learn a little more about that extra value meal that goes down so easy, you might not like what you find. Check out our list, watch Super Size Me, and head to your nearest farmers market before you ever drive-thru again. You've seen those horrible movies about how poorly animals are kept when they're being led to slaughter, and they aren't showing you those heart-wrenching photos just for the ratings. Many of these factory-farmed animals are kept in such a small space that they are forced to stand in their own feces, have osteoporosis and joint pain because of their confinement, and some chickens get their beaks cut off so they don't go nuts and attack one another because of the small corridors. To keep the animals from getting sick in these conditions, they are pumped full of antibiotics, which often end up in our food. 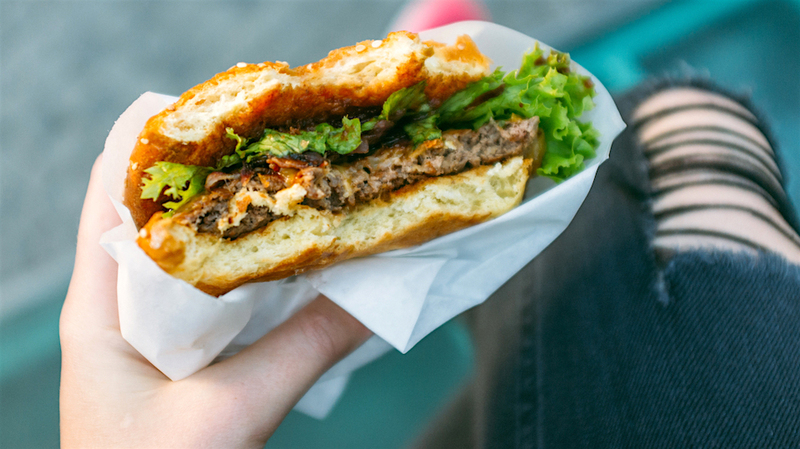 That's not only making us want to stop eating fast food, it's making us want to be vegan. I'm sorry, what is in my food? According to the Matador Network, some fast food's chicken nuggets contain a chemical preservative called tertiary butylhydroquinone, which is derived from a petroleum. Yep, the stuff you put into your car. That's not all either. Some chicken products are mechanically separated, which means those scraps that would normally go to waste are ending up in your nuggets. Plus, if you were even to study the ingredients in your favorite meals, you'd be shocked to see how many of them are chemical preservatives, artificial coloring, monosodium glutamate and more. It doesn't take an expert to see that most fast-food chains don't use the highest quality of ingredients. You can tell by the rubbery patty, the wilted lettuce leaves and the extra-chewy chicken. They use the cheapest parts to make the products, so when you're eating your hamburger, you have no darn clue what part of the cow it came from — or heck, if it's even cow you're eating! Here's an idea: Spend the extra few bucks, and make your own burger from meat you bought yourself. Sad to say, many of the employees hired on to do the cooking, food handling and prep don't have the necessary training or food safety education they need to do it right. Not their fault — the companies often don't offer training because these restaurants have such a high turnover rate. On any given day, you could have someone preparing your hamburger who didn't wash their hands or who was playing with frozen raw meat right before they manhandled your bun. Save yourself the food poisoning. It's called fast food for a reason, friends. Most of the meals you get aren't cooked with thought or love; they actually aren't even cooked on a stove. Many are unwrapped from their frozen containers and thrown into a dirty microwave. This saves the managers the time and money it would take to teach the cooks how to prepare the food properly and not worry about cross-contamination. It saves their butts but doesn't make yours look any prettier.